The story of this Sony factory, which took the full brunt of a powerful tsunami that washed through a year ago, reflects that of much of Japan's northeastern coast - abrupt tragedy, battled with ingenuity and stoic resolve, and now grim economic reality. 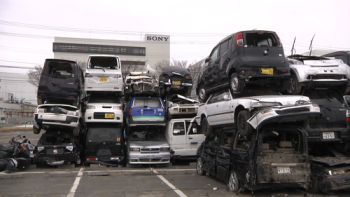 Electronics factories throughout the region were disrupted by the magnitude-9.0 earthquake and deadly tsunamis that followed on March 11 last year, but few took the damage like Sony's Sendai Technology Center, located less than a mile from the sea. Earthquakes are common in the region, but tsunamis less so. Locals were caught off guard when the waters crashed this far inland, flooding to meters deep within minutes and carrying a churning morass of cars and debris. Many in the neighborhood raced to take refuge in the facility's main building, at six stories high the tallest around. Employees at the factory, Sony's main production base for professional videotapes, blank Blu-ray Discs and other media products, quickly made makeshift rafts from containers and other materials. They used them to pluck people from the freezing waters and later to ferry food and supplies to nearby shelters. CEO Howard Stringer would publicly commend them for their "bravery, generosity and ingenuity." When the water receded in the following days, the roads were completely blocked with smashed cars and debris, and contents of the factory had spilled out into the surrounding neighborhood. Weeks later, blue labels from Sony's video tapes still fluttered around the mud-caked streets nearby. 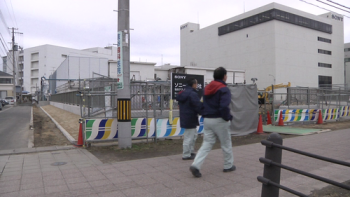 Workers clad in masks, protective suits and thick boots set about restoring the factory almost immediately after the waters cleared, but the Sendai Technology Center was among the last of Sony's tsunami-damaged plants to come online. Full production didn't begin for nearly six months, and the manufacturing of some parts was shifted to other locations entirely. Workers on their way into a Sony factory in Tagajo, northern Japan, a year after the area was ravaged by a powerful tsunami. Today, when factory employees arrive they park across the street from a lot piled high with stacks of smashed vehicles, and walk by dump trucks and large cranes that are still making repairs. Sony representatives declined interview requests and access to the factory grounds. The plant is located in Tagajo, a sleepy suburb of 61,000 residents. They were spared the utter devastation of other communities nearby, their 189 dead or missing a small portion of the 19,000 overall in Japan. But nearly half the families there had damage to their homes, as well as hundreds of local businesses. The Sony factory once again stepped into the void, making about a third of its 113,000 square meters of floor space available to local businesses, free of charge. A local government-backed organization that is running the program has signed up nine companies and filled half the available space. "This will help reinvigorate the business community," said Hitoshi Ishikawa, an official at the Miyagi Organization for Industry Promotion, which manages the site. "It's very rare for a company to do this." Unfortunately for some workers, the space on the factory floor became available because Sony is scaling back its own production at the factory. It also made battery electrodes and optical components for projectors before the disaster, but production has been shifted elsewhere. Employment at the Tagajo plant, which was over 1000 previously according to media reports, had been slashed to 900 as of January. 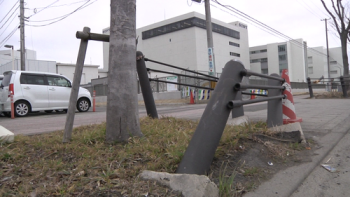 Twisted barriers remain in front of a Sony factory in Tagajo, northern Japan, a year after the area was ravaged by a powerful tsunami. So the same local employees that were praised by Sony's CEO are now being laid off, for some through the company not renewing their contracts. This is common in Japan for large companies, and can avoid the stigma and legalities of outright firings. Earlier this month a protest march was held near the factory, and organizers said about 300 people showed up. "They are using the disaster as an excuse to let people go," said Shinni Otomo, a local union representative. A Sony spokesman said the cutbacks were made as a result of the shift in production. Sony is facing $3 billion in losses during the current fiscal year that runs through this month, weighed down by one-off costs like the earthquake and flooding in Thailand, but also because it is struggling in a tough economy where consumers have plenty of options from foreign competitors. Incoming CEO Kazuo Hirai, who will take over from April, has not ruled out more job cuts. All along Japan's coast, a similar dynamic is unfolding. For residents that banded together in the days and months after the disaster, the adrenaline of surviving the first year is fading, and they are again faced with the reality of a stagnant economy.